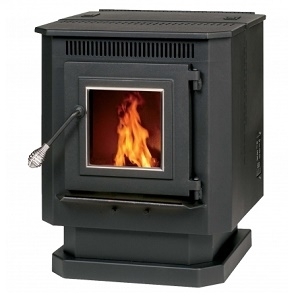 See (and feel) for yourself what makes this quaint, compact pellet stove one of the best-selling (if not the best-selling) pellet stoves of all time! E.P.A. Certification (and WA State approval) means that it can be sold and installed nearly anywhere. In addition, this model is very economically priced, saving you hundreds of dollars over comparable brands from more expensive manufacturers. Don’t let the price fool you, though, because this stove has the extras that the “elite” models have. The fire is started with our Auto-Start One-Touch Igniter, and the user-friendly digital Control Board helps you set the feed rate and blower speed to a setting that makes your home feel the most comfortable. The hopper holds a full, 40-lb. bag of pellets (plenty for overnight burns), and the unique, cast auger feed system feeds a firebox that can heat up to 1,500 sq. ft. It is also Mobile Home approved. Outside air hook-up is mandatory, and an Outside Air Kit is included with the unit (a value over $60). Window trim is also included.